A fiendish plague known as the Gray Death ravages the land. A band of heroes is sent to investigate the plague and attempt to end it. They must embark on an epic quest to recover the pieces of a lost artifact - the one hope of ending the plague before it is too late. Standing against them are the architects of the plague and their myriad agents. Can the heroes succeed...? 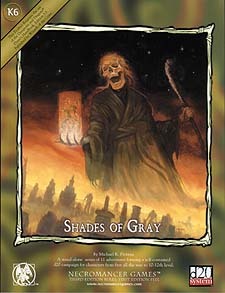 Shades of Gray is a stand-alone series of 11 adventures forming a self-contained campaign that can take characters from first all they way to 10-12th level. Adventurers must solve mysteries, survive intrigues, travel to exotic locales, brave dangerous dungeons, defeat menacing villains, and overcome deadly obstacles to complete their quest and end the Gray Death. These adventures and locales stand alone, and can easily be placed into any setting you choose. Designed for use with the Third Edition Revised rules.